Growing up in Colorado, I always looked forward to spending Memorial Day weekend in Kansas for our three-day family reunion. The carnival-esque atmosphere with odd characters and activities were thrilling. The annual reunions began as a birthday celebration for my 2nd great-grandmother Minnie (Hawks) Lumpkins Barber. Born in April 1881 in a Kansas prairie dugout, Minnie was married twice (first to John Lumpkins and, following his untimely death, to Joseph Barber). She had ten children - eight of whom lived to adulthood. As her children grew and married, her descendants climbed into the hundreds. To celebrate her birthday, aunts, uncles, and cousins would convene at Webster Reservoir for camping, karaoke, bingo, fishing, and a Memorial Day potluck dinner. 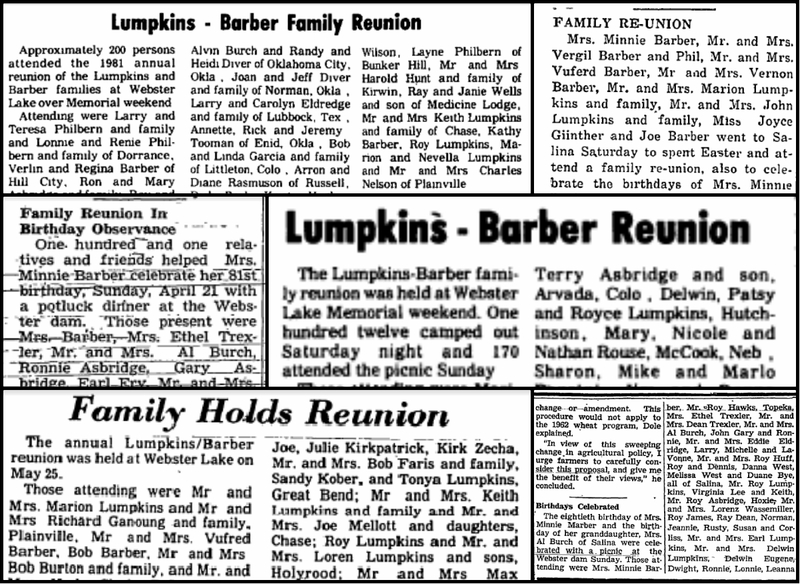 The reunions were immensely popular, drawing hundreds of family from across the country, and continuing unabated for nearly 40 years after her death in 1973. As Minnie's children began to pass away, attendance at the reunions started to decline. Eventually the gatherings became less frequent and the location switched to church basements or local restaurants. 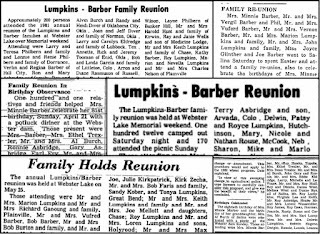 It seemed that the headline grabbing strength of the reunions was bound to be lost, proving the Legal Genealogist's point that family history is typically lost within three generations. Last year, after my grandmother was diagnosed with and dying from cancer, it occurred to me that I was losing my link to this family. The person who I relied on to tell me stories and answer questions about the many aunts, uncles, and cousins that made the reunions a weekend of wonderment wouldn't be around forever. I felt compelled to salvage the family link and preserve the family bond. Facebook was my go-to tool because it is ubiquitous and easy to use. I created a closed group and began inviting family to join. In the span of a couple days, membership had climbed to over 100. There was an appetite for the group. To give the group a defined sense of purpose, I drafted and posted a brief mission statement. 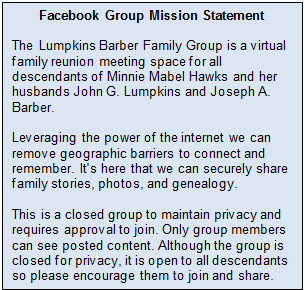 I wanted to make it clear from the outset that the group would be a safe place to share stories, genealogy, and photos. Despite the sizable membership and articulated purpose, the group's initial postings lacked focus and frequency. I needed a game plan to infuse energy into the group and bring the family's history to life in a way that better engaged members. I created a Google calendar that included birth, marriage, and death dates for Minnie, her parents, her husbands, their parents, and her children. When an ancestor's birthday would roll around, I would create a succinct Facebook post with photos and a brief blurb that celebrated and informed about their life. 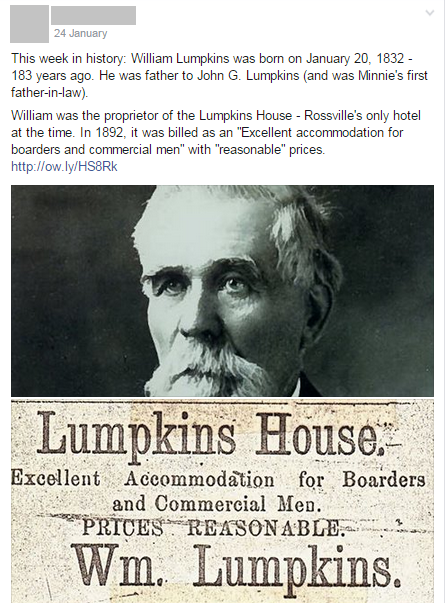 Check out the sample post for my 3rd great-grandfather William Lumpkins (Minnie's first father-in-law). Group engagement numbers shot up. Posts began to gain dozens of likes and elicited comments from relatives recounting their own memories and stories. Most recently, I've started farming out the updates. When a particular aunt or uncle's birthday rolls around, I now reach out to one of their children and ask them to take on the responsibility for posting the commemorative blurb. They love it, engagement numbers continue to climb, and comments are effusive with praise and excitement to see the family's history. The group celebrated it's one year anniversary in July. Since its inception, membership has grown to nearly 130, the group's photo album is bursting with family pictures (many of them new to me - the family historian! ), and memories are being logged (and jogged, for that matter!) in comments. It's a true family reunion in the digital age that's preserving our history for at least another generation. I hope. 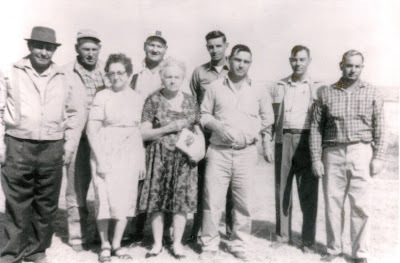 Perhaps the group's greatest success to-date, was the reinstatement of a family reunion in Kansas. Restored connections and renewed interest in our shared heritage led to creating a Facebook event for a Memorial Day family reunion. It was the first in years and drew family from several states for an afternoon dinner and fellowship. As the group continues to gain its footing in the coming year, I'm hopeful for an even stronger showing in 2016. What about you? 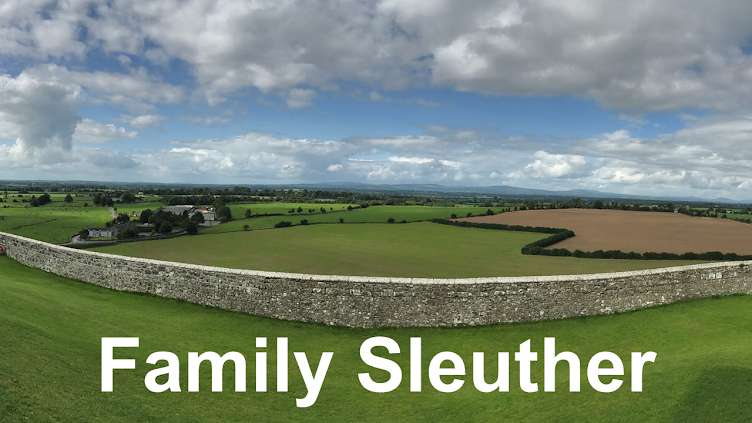 Have you had luck with any of these strategies for keeping your family connected and engaged in family history? What tips do you have? That's fab news! Thanks a bunch, Jana. Very much appreciated, as always. Lots of wonderful ideas here. I never thought of a facebook page for the family. Thanks for sharing! Thanks, Colleen. If you try it out, let me know how it goes. I'm eager to hear best practices from others.